Share website screenshots directly in your channels. 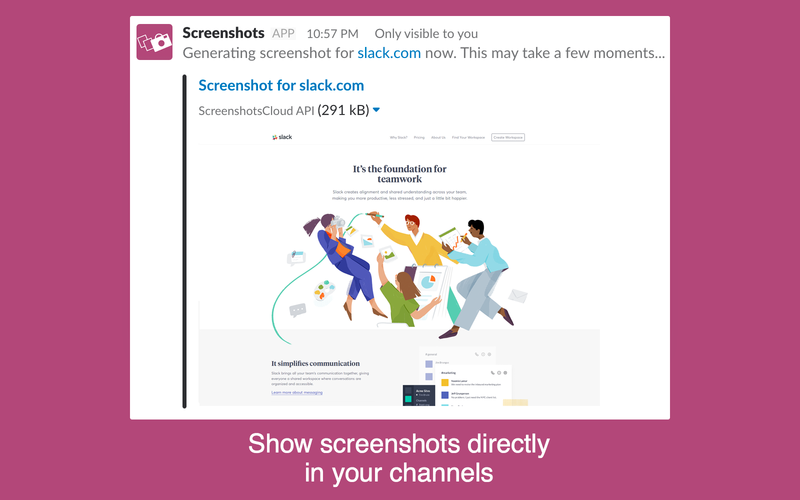 Link your ScreenshotsCloud account with Slack to add screenshots fast high quality screenshots to your channels using the /screenshot url slash command. All your Slack workspace users can create screenshots using a single ScreenshotsCloud account in any of your Slack workspace channels. All users in the channel you post to can see your screenshot. Simple! Sign In or Sign Up to ScreenshotsCloud. Navigate to your Dashboard or revisit this page. Click the Add To Slack button on the page. Use any of these command parameters by adding them in the command line, url must come first but any of the other parameters may come in any order, for example: /screenshot google.com width=1024 format=jpg. url Required. The website address that you want to take a screenshot of, with or without http:// or https://. width 1920 Width of the thumbnail. We resize from the viewport_width to this width value after the screenshot has been captured. This option is only valid for png or jpg format options. viewport_width 1920 Width of the browser viewport this is the actual width of the page before we resize it for the thumbnail. viewport_height (1320) Height of the browser viewport, if you do not give this parameter we will calculate it for you based on viewport_width in 16:10 ratio. full_page false If true capture a full length screenshot of the requested page. If false capture only the viewport area specified in viewport_width and viewport_height. format png Valid options are jpg or png. cache_time 3600 Amount of time in seconds to wait before taking a fresh screenshot for the same request. Maximum 2592000 (30 days), minimum 1. Ignored if force parameter is true. force false Force a new screenshot to be taken with no cache. mobile false Shortcut to set pixel_ratio, user_agent, viewport_width, viewport_height and width to that of the latest iPhone. pixel_ratio 1 Multiplier that sets the pixel density of the page relative to the resolution, useful for taking retina screenshots (2).